Building organic traffic to your site is one of the most powerful things you can do to grow your online business, and, while it takes time and effort to get there, a high search ranking drives free, qualified traffic to your site. But getting to a high ranking can be difficult and time-consuming, and Google keeps the world somewhat in the dark with respect to their algorithm. Online marketers like us piece together the information Google does unveil, but the rest is up to experimentation. What exactly do the successful companies do? — The ones that drive millions of organic visits of month? We decided to find out by taking a look at their backlink strategies. Taking 10 random samples of 100,000 links across 10 different successful websites in a variety of verticals (including Airbnb, Hello Fresh and Udemy), we did a comprehensive SEO audit — with some fascinating results. In this article, we’re going to share one of our case studies: Udemy. Udemy is an online learning and teaching marketplace with over 42,000 courses and 14 million students. With Udemy, you can learn programming, marketing, data science, and more, at your own pace and schedule. Their website garners a hefty 6.2M organic visitors per month. Most SEO experts have found that one of the best ways to improve your organic ranking is by building backlinks from reputable sites. 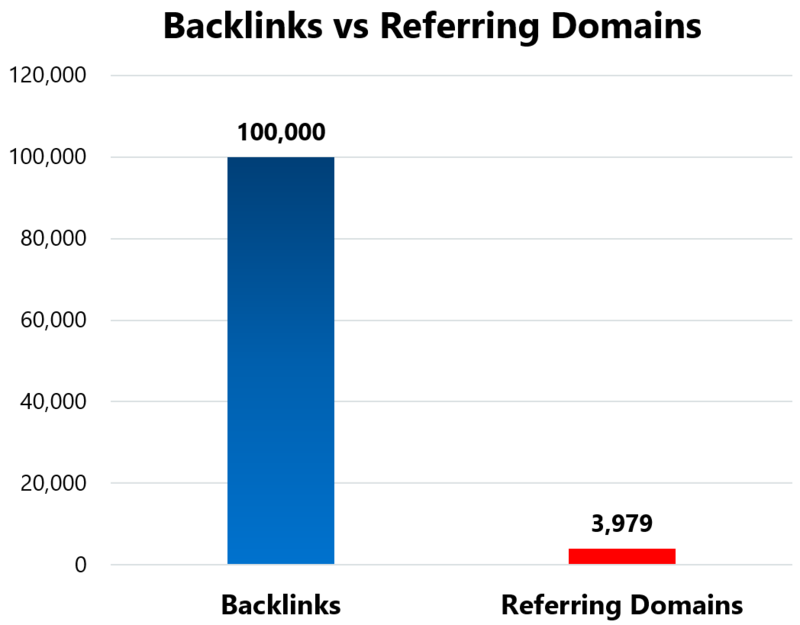 While backlinks are powerful, they’re not all weighted equally. In order to combat low-quality links trying to game Google, the search engine giant has rolled out a number of updates over the last two decades in order improve the quality of its results. The updates have discredited sites that use black-hat link building strategies, even actively penalizing them. First, you’ll need a few platforms to perform a comprehensive backlink audit. Here’s our recommended tool stack. Ahrefs – a broad toolset for SEO & marketing run on big data. They produce some very helpful backlink reports that show us not only how many links a site has, but what kind of quality they are. Majestic SEO – a link intelligence tool for SEO and marketing that shows your inbound link and site summary data. Moz Open Site Explorer – a tool for identifying link-building opportunities. URL Profiler – a content and backlink auditor software. Google Search Console – the newer name of Google’s webmaster tools which can be used to find on-site errors like broken links. 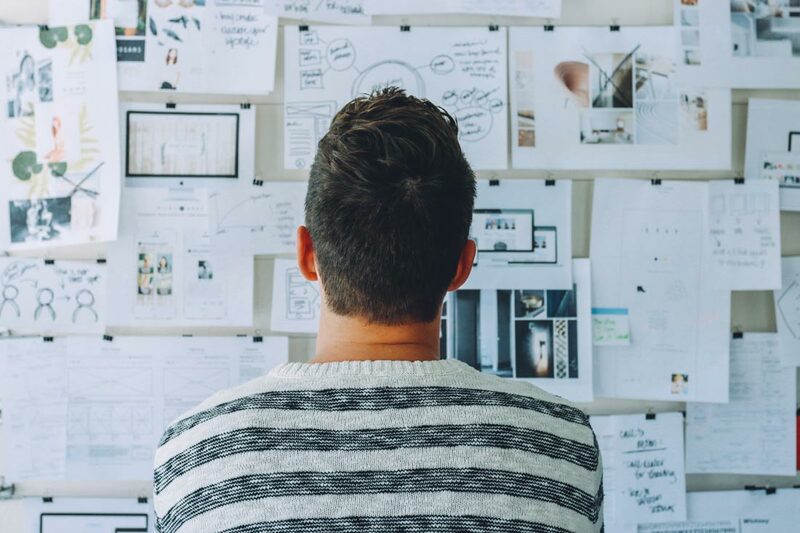 When completing an audit, you want to keep an eye out for two major things—link-building opportunities and unnatural links. In our case study, to identify opportunities, we looked at what kind of successful links Udemy was getting and if there were ways we could double-down on that to get even more. 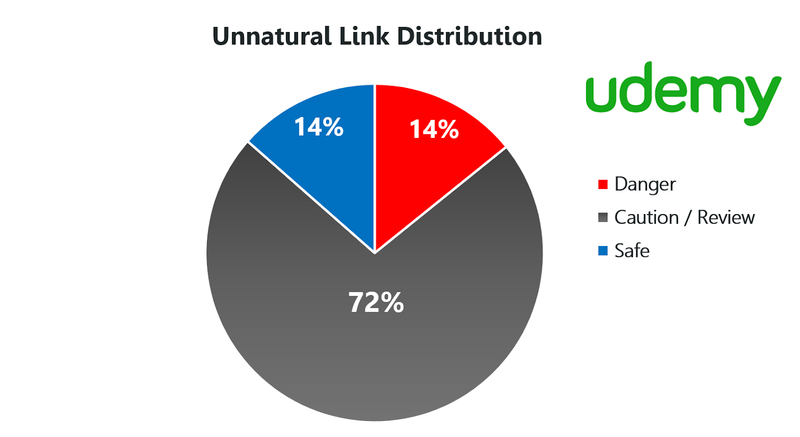 Unnatural links, on the other hand, are red flags. If a link is classified as unnatural, it means Google believes it was obtained unethically (such as purchasing or using a private blog network). Even if this isn’t the case, Google won’t send you a friendly letter asking you to defend yourself; They’ll simply cut off your traffic. These are not considered “quality” links, so you’ll want to avoid them at all costs. Danger List - These are the links that are extremely likely to be unnatural and should be considered for disavowal. Caution List - These are the links that could be unnatural and must be manually audited to determine if they are safe or dangerous. Safe List - These are trustworthy, authoritative links that are most likely to be natural. Getting more of these will help boost organic visibility. Link Schemes - These are large groups of similar links that are coming from the same source, and are the most probable cause of site-wide links. Link Opportunities - Some websites (especially popular brands) earn natural, high-quality links without knowing it. An audit will help you discover those sources, so you can build relationships and earn more links. Link Equity Consolidation - In almost every case, there are authoritative inbound links pointing to 404 pages on a given website. Those 404 pages should be revived by implementing 301 redirects to a live final destination URL to reclaim the lost link equity. Within these reports, the main link metrics measure four key categories: diversity, trust, authority, and relevance. 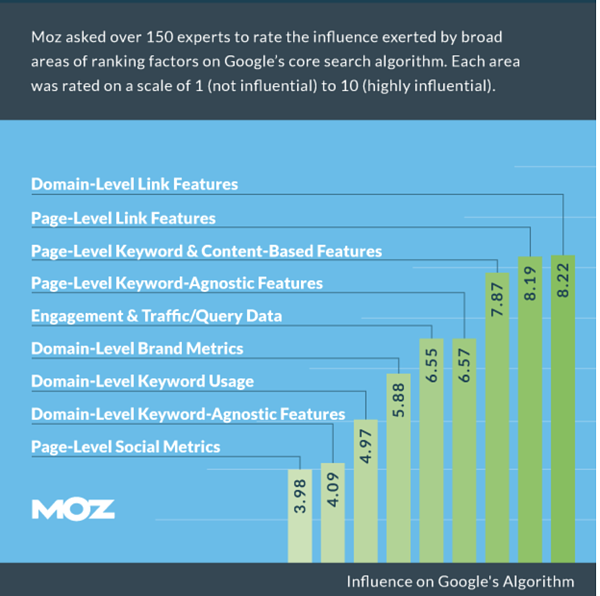 Moz Domain Authority (DA) – An overall website rating that is calculated by metrics, such as linking domains, number of total links, MozRank, MozTrust, into a single 100-point logarithmic score. The higher the score, the more valuable a link from this site is. Ahrefs Referring IP C-Class Diversity – IP Addresses are divided into lettered blocks [AAA.BBB.CCC.DDD]. The more referring C-Class Duplicates that exist within the link profile indicates that the site is likely to be engaging in link networking which can lead to being penalized by Google. Now, to the results: here we’ll share the results of our audit, what they mean, and our recommendations for how Udemy can improve their SEO strategy. On average, Udemy earns links from approximately 2,000 unique referring domains per month. That level of referring domain growth has been instrumental in their organic search visibility because Google rewards sites for attracting a large volume of links. This volume is something we want to maintain. However, we do want to improve upon their link diversity. At the time of the audit, Udemy had 6.35 million backlinks found across the web but only 67,300 referring domains. That 94:1 ratio means that on average a site that links to Udemy links 94 times. This high ratio is a red flag. While more links is usually a good thing, Google also wants to see that they come from a diverse collection of sources. 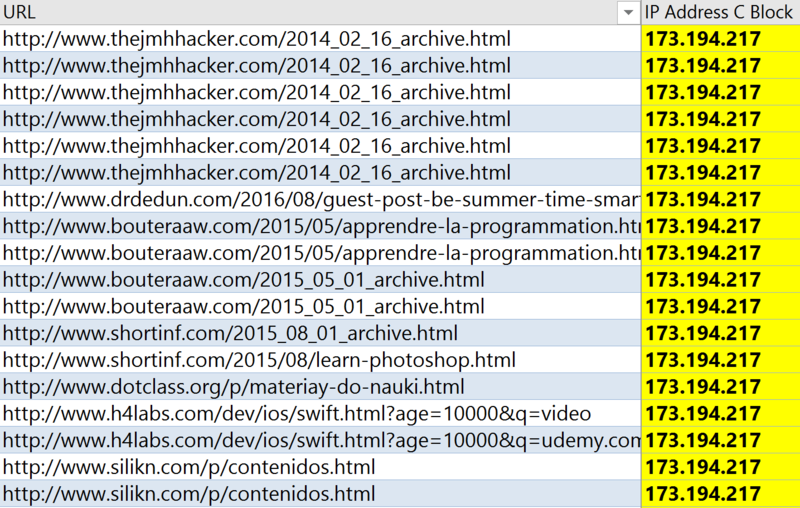 It is possible that all of those links are relevant, trustworthy, and authoritative, but it’s probably a sign that some domains are spamming Udemy links. Even though this might not be Udemy’s fault, Google could penalize them for trying to spam their link to trick search engines. At the very minimum, it will devalue those links, so the number shown is likely very inflated. Sitewide links, as their name suggests, are those which appear on all or most of the pages of a website. A common place to find these is in blog-rolls or feeds attached to the footer of a site. While common, you need to be cautious about these links because they can sometimes be classified as unnatural. According to our audit, this was the most common type of unnatural link point to Udemy. It seems that a large portion of those links were from widgets. 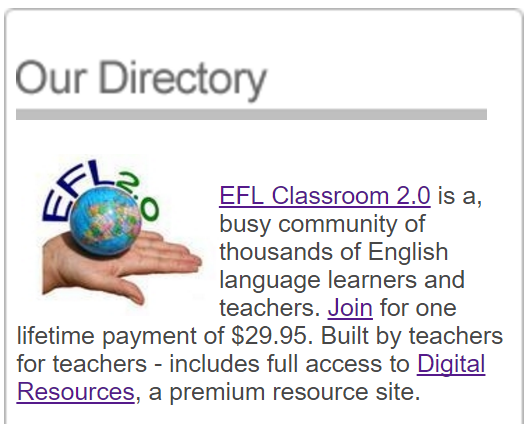 For example, Ahrefs reveals that EFLClassroom is linking to Udemy over 400k times. Google calls out this site as likely hacked, and the meta description clearly states it’s a directory link website. This is a strong indicator of low-quality links and a clear sign of an untrustworthy website that lacks brand credibility—not the type of website you want 400,000 backlinks from. 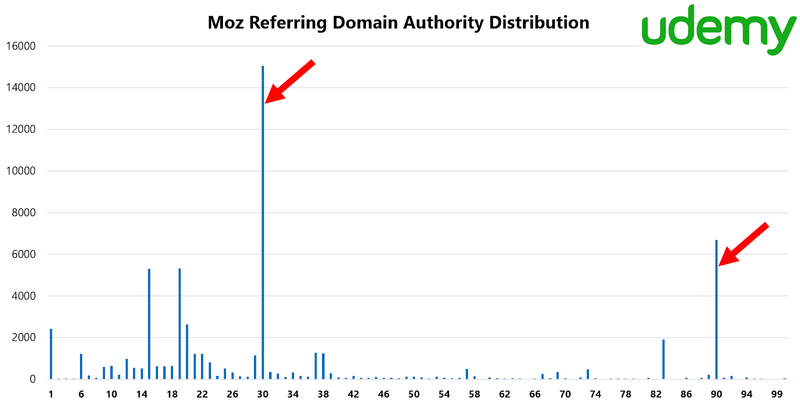 The Moz Referring Domain Authority Distribution for Udemy showed that most referring domains have an authority (DA) of 30 or less; however, there were large spikes at DA 30 and DA 90. Upon reviewing the site, it looks pretty safe, but upon further investigation, we see that it’s a sidebar widget link embedded into the template of every page on the site. This is the type of link that could potentially get you into trouble, especially given that Google recently issued a warning on sitewide widget links. They believe widgets are often a spammy attempt to manipulate PageRank. 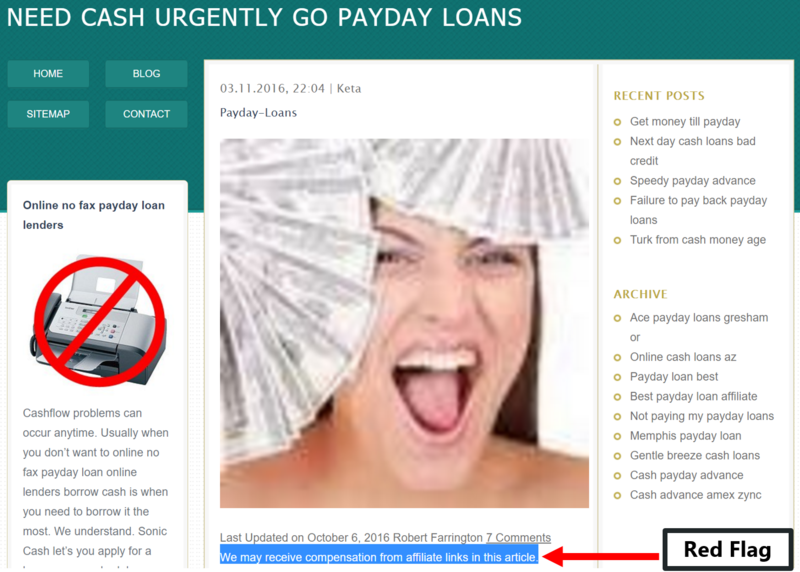 While the site itself is not dangerous, this could be perceived as unnatural linking strategy and could get Udemy penalized in organic rankings. Based on this, I’d recommend Udemy ask the blog owner or webmaster to implement a rel=nofollow attribute to the link in order to remain on the safe side. Normally, this may not be worth Udemy’s time, but because there are so many incoming widget links, it would be wise for them to address the issue. 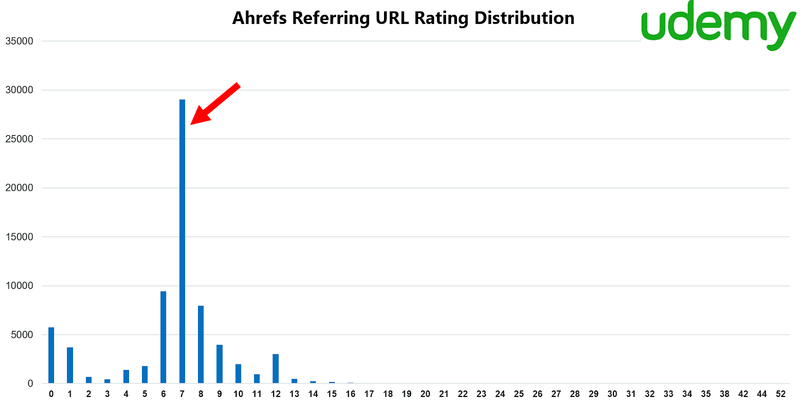 The Referring URL Rating distribution below tells us most links are of low authority. However, there appears to be a spike at the URL Rating 7. Whenever you see a spike like this, you should investigate. When we dug deeper, we found that this site loaded was the source of a large portion of these links. This was loaded with what appeared to be a bunch of unrelated links. It’s clear the links are not reliable or trustworthy, nor are they relevant to the content Udemy provides. Once again, sites like this can be dangerous to your organic ranking because they appear unnatural to Google and could be penalized for attempting to manipulate PageRank. 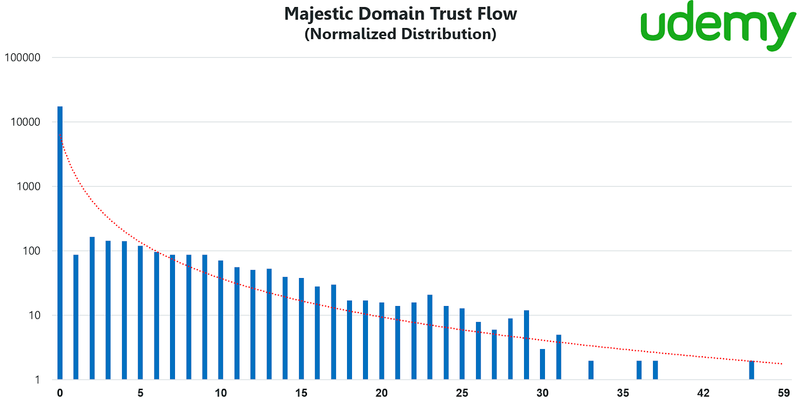 The normalized distribution of Domain Trust Flow shows that most referring domains have a Trust Flow rating of zero, which is problematic. 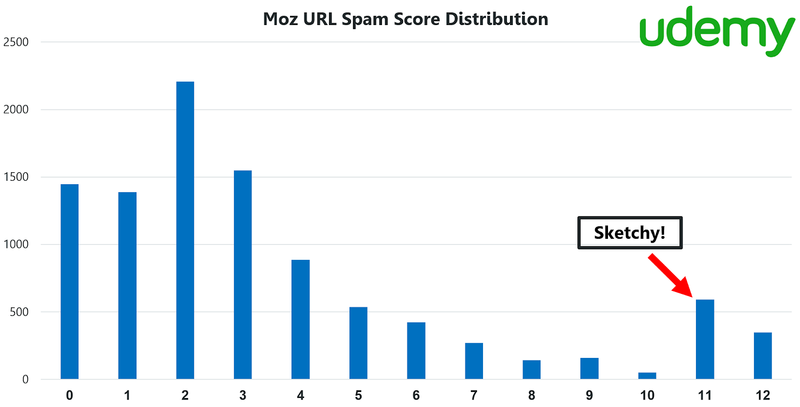 Even beyond zero, the distribution is weighted heavily to lower-ranking scores, which means the majority of referring domains are not considered trustworthy. Note how they state that they accept compensation for links on their site. This is a red flag. It’s not necessarily a problem to earn affiliate commission off your site or include this disclaimer, but it’s a sign that the site may promote many low-quality sites without verifying them.Accompanied with the unprofessional appearance of the site, this is all the more likely. If it is indeed the case, Google will no doubt recognize this and devalue links sent from this site to compensate. 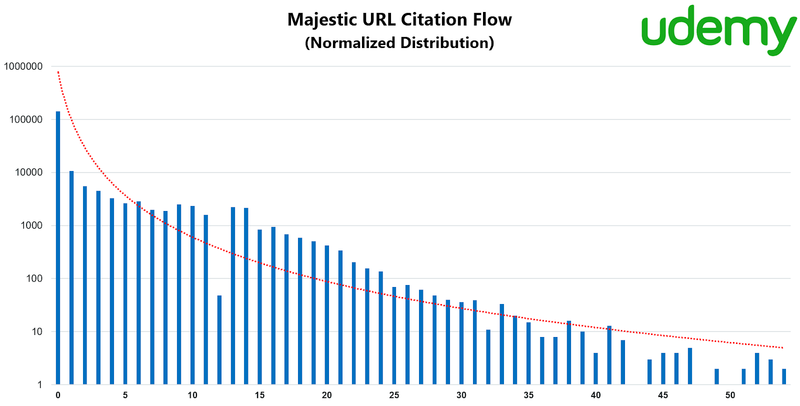 The URL Citation Flow is showing a drop-off that is slightly less intense than the Domain Trust Flow. 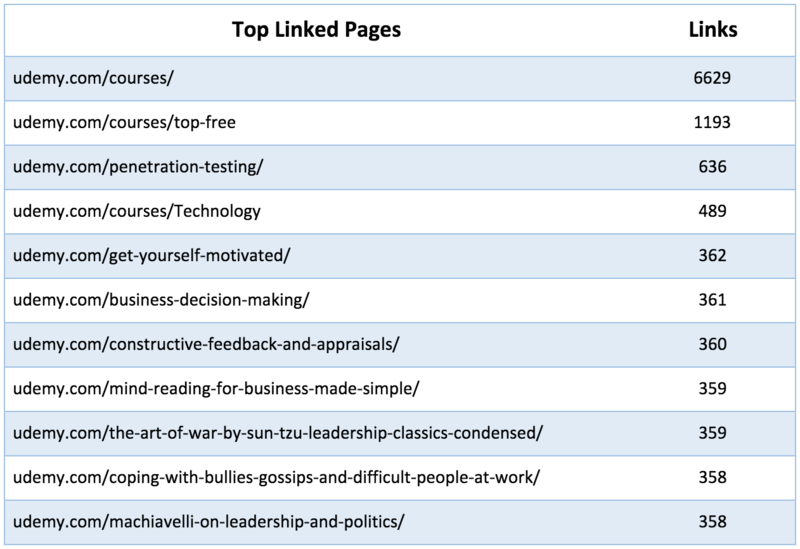 However, we can still conclude that the vast majority of these referring links are not very influential and that the majority of them aren’t bringing strong value to Udemy’s link profile. First, they need to examine where these low-scoring links are coming from to verify that they’re legitimate sources which won’t be penalized for spam. We’ll address this more in-depth with the next metric. Second, Udemy should keep in mind that a large portion of their links aren’t doing much to contribute to their profile (or SERP rankings). If possible, they should adjust their link building strategy to focus on adding more authoritative links to balance out their profile. For reference, Udemy has a citation flow score of 45. 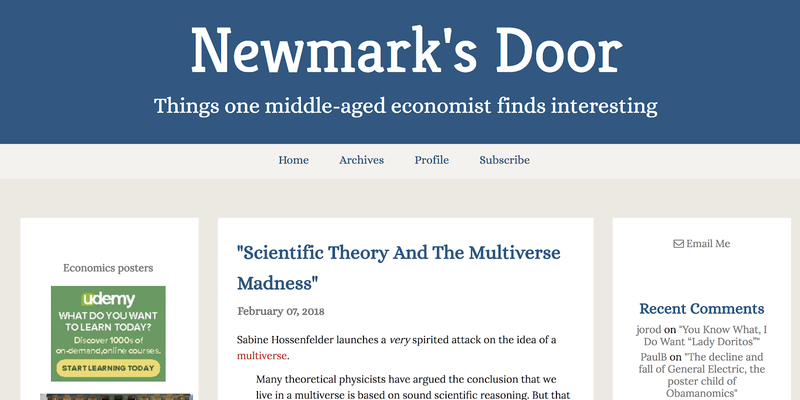 It would be nice to have more links of a similar authority linking to the site. 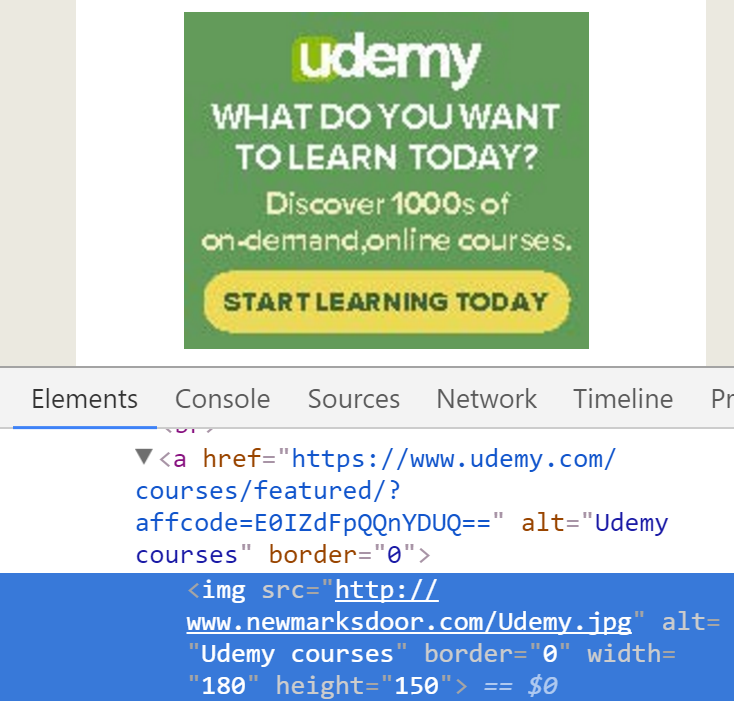 Fortunately, Udemy doesn’t have too many links that cross this threshold. Still, the ones that do should be investigated and addressed. The entire site is just a list of links on an international domain. The links don’t have any context or logical organization. This is the definition of link spam and Google hates it. 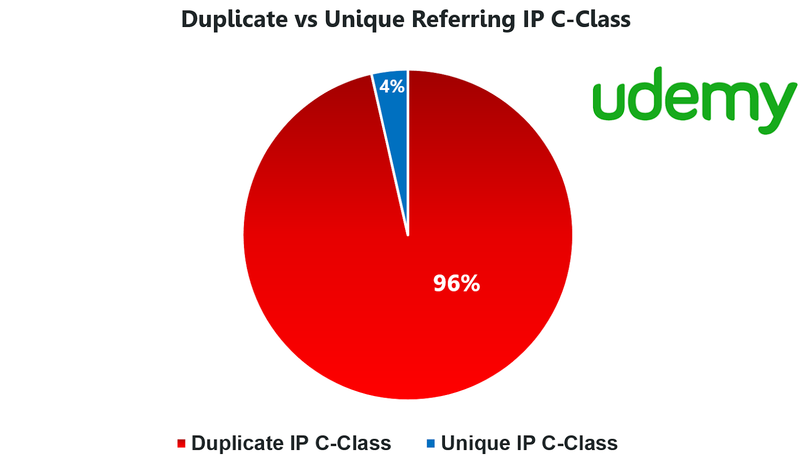 The Duplicate IP C-Class is also a staggering 96%, which is a cause for further investigation asGoogle may flag this as a black-hat link building scheme. Essentially, these are websites with different domain names, but all are hosted on the same IP C-Class. We don’t need to get into all the technical stuff here, but this suggests to Google that these sites may have the same owner or are somehow managed by the same entity. Because of this, it may decide that the links are created unnaturally to manipulate PageRank. Below is an example of low-quality links from different referring domains all hosted on the same IP C-Class. This is commonly known as a “link network” and is a big no-no. Anchor phrases tell Google what a site or page is about (and thus what terms it should rank for). It can also give Google a bit more context on what your site is about. Think of them as keywords chosen for you by other sites. 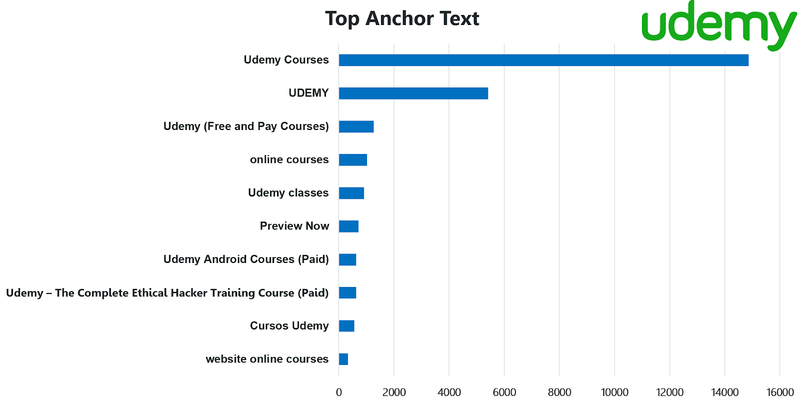 It’s not uncommon to have a large percentage of your anchor text be variations of your brand name, but it’s fantastic if you find key commercial keywords up there as well, such as “online courses” for Udemy. Udemy: So -- What Did We Learn? Udemy has acquired authority, relevance, and trust over time. It did this largely by building a product that is useful, practical, and makes people’s lives easier. In other words, they created real value. The #1 issue affecting Udemy’s link profile, however, is referring root domain diversity, which means that despite the millions of links pointing to their site, there aren’t too many unique sites giving them backlink love. In our sample of 100,000 links, there were only 3.9k unique referring domains. As mentioned earlier, this indicates a high probability of site’s spamming links to Udemy.com without proper context and could cause them to be penalized by Google for attempting black-hat SEO, even if they have nothing to do with it. Our sample was also able to identify a small batch of safe links and danger links, but approximately 75% of the link sample could not be determined programmatically. It is recommended that these links be reviewed manually and evaluated by someone who has experience qualifying links as natural or unnatural. Due to the nature of Udemy’s business model, their content earns lots of links naturally. With this in mind, Udemy should continue to collaborate. Not only will the links produced drive traffic from large audiences to Udemy, but they tell Google that it’s a trustworthy and authoritative source since such a diverse group of authoritative sources are writing relevant content about them. 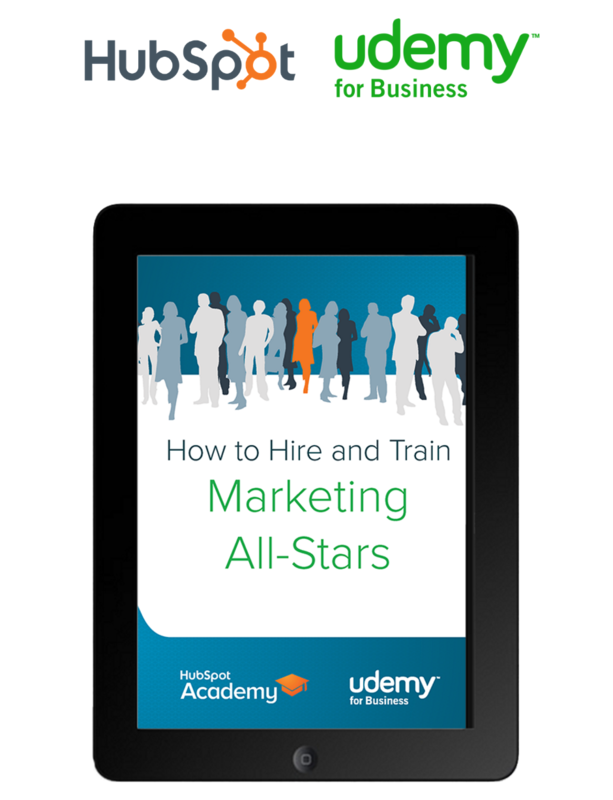 Another great example of collaboration is s this course created with HubSpot. This has been a golden source of links for Udemy. This type of niche influence is critical to winning the SEO battle (as well as customer growth, retention, and revenue battles!). While these sites may have a lower domain authority than a site like Mashable, they represent the pinnacle of trust among their community. Few things drive SEO results like links originating from a wide variety of trustworthy niche sources on a common topic (in this case, online classes). In the post he links to his Udemy course and This shows that he personally vouches for the value provided by itUdemy.com. If Google finds his site trustworthy, it will pass on that trust to Udemy. For each of these strategies, the core focus has been that same—build backlinks from a diverse group of trustworthy sources with domain authority in a relevant, sincere context. Focusing on this will never get you penalized and should be the primary focus of any link building strategy. While there is no serious difference between the .org and .com domain, in this case, many of the .org sites were actually duplicates of .com sites hosted from the same IP C-Class. They are intended to manipulate visitors and Page rank so Google will classify them as unnatural, black-hat links and penalize any site “accepting” links from them. By default, a site “accepts” any backlinks sent to it. In our analysis, one thing that was really helping Udemy was their ability to get contextually relevant backlinks from trustworthy niche sites. There’s nothing people love more than a good old-fashioned success story, so why not give it to them? Creating blog posts highlighting the success of both students and teachers would give these niche leaders (who often run their own class) something to write about and link to from their site and share with their followers. With such a large user base, Udemy is bound to have success stories with interesting angles, too, like a single mother learning how to build an entire company on her own so she can stay home with her kids. Creating a collection of unique success stories like this could also help attract more links from those authoritative press sources mentioned under our first recommendation. The same could be said for sharing user-generated or curated content in general. 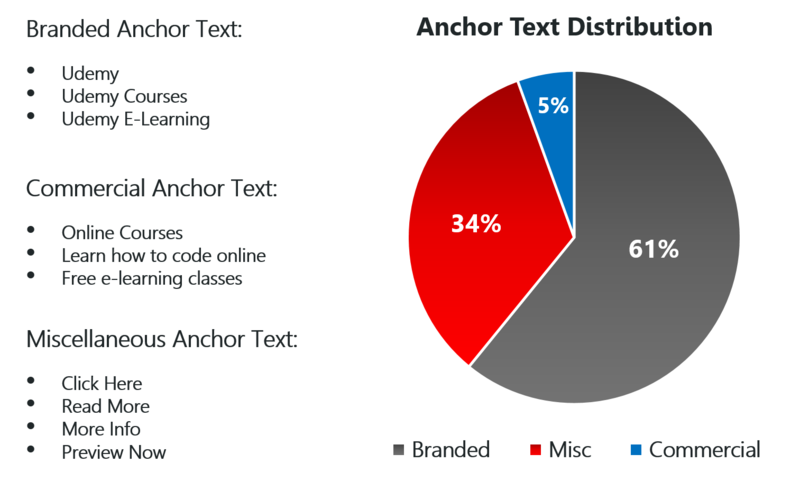 While Udemy’s anchor text mostly follows a natural pattern with 61% branded anchors, its 34% miscellaneous anchor text is unusually high. One strategy Udemy could use to build more links with non-branded, commercial anchor text is guest posting. They should develop a list of keywords with commercial intent they wish to rank for on Google and offer to write guest posts for high Domain Authority sites and make sure to link back to Udemy.com using that term as their anchor text. Since Udemy’s pages are probably often the destination of calls-to-action (from teachers promoting their course), it’s unlikely they will ever fully reverse this ratio, but that doesn’t mean they shouldn’t try to improve it. A link that hits an error page instead of content isn’t passing its authority on and isn’t helping any of your pages rank. It’s a waste of perfectly good link juice. Thankfully. it’s one of the easiest problems to fix and you can reclaim that SEO equity quickly. All Udemy needs to do is identify the broken resources on their site and find an appropriate place to send that traffic. 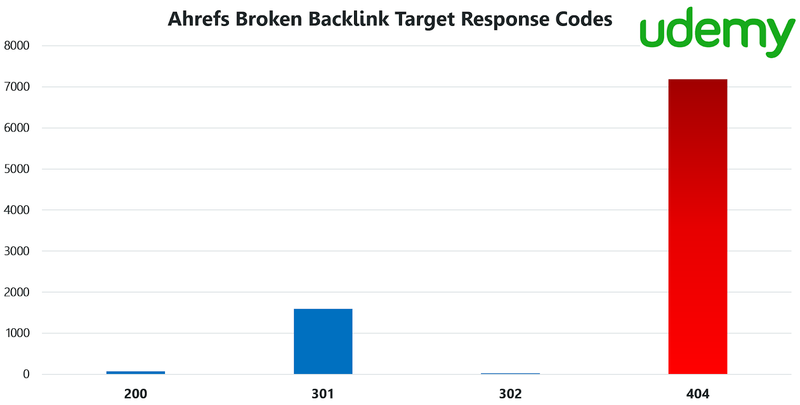 Once they know where the traffic should be going, they just need to set up a 301 redirect (note: other redirect protocols do not work the same way. You need to use 301). In this case, with thousands of links you should look for the most common destinations first. 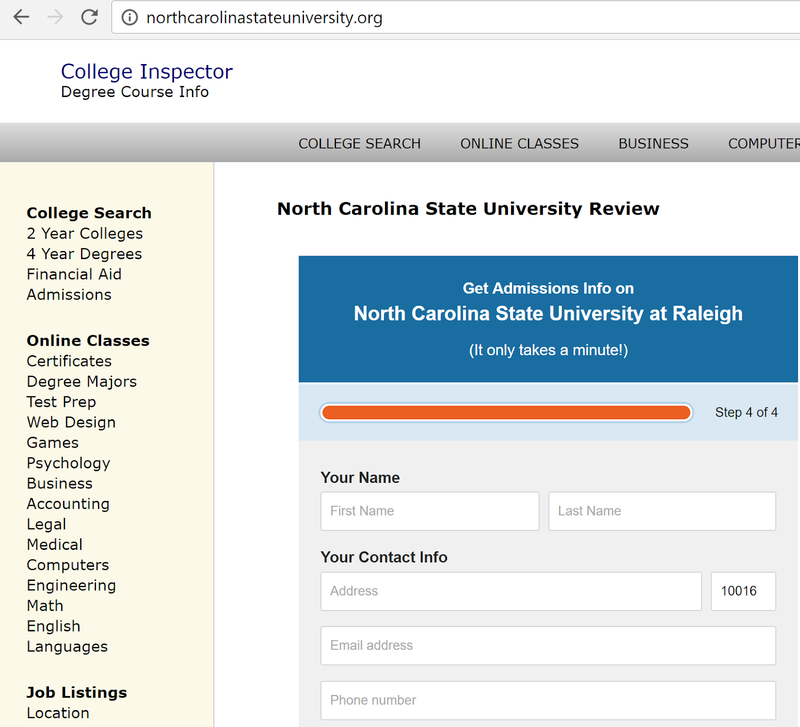 The rest of the traffic can be forwarded to broader category landing pages (like support, course search, etc). Udemy is a great brand and has done an impressive job standing out in a very competitive marketplace. Because of this, they’re at a low risk for link penalization, which is great -- but that doesn’t mean they should ignore some of the warning signs identified in this audit. If you found this case study insightful, you should check out the rest of our 1 Million Backlinks Analysis Series, including companies like Lyft, Dollar Shave Club, Airbnb, and download the comprehensive case study.